Monday will mark the 25th anniversary of the first U.S.-listed ETF, the SPDR S&P 500 ETF (SPY). Born out of the 1987 stock market crash (I highly recommend this fantastic account from Bloomberg’s Eric Balchunas), SPY sparked an investing revolution. 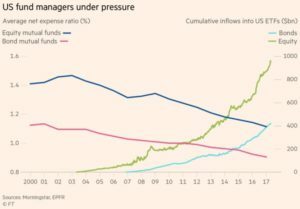 In the two-and-a-half decades since SPY’s launch, ETFs have disrupted the stodgy, good old boy mutual fund and broker complex, growing into a $3.5 trillion monster. Investors are winning – thanks to SPY and ETFs. Lower costs, greater transparency, tax efficiency, flexibility, improved portfolio construction, a leveling of the investment playing field – all resulting from ETFs’ uprising. When SPY was first created, high cost mutual funds with well-compensated star managers ruled the day. Brokers were incentivized via lucrative commissions to push these (often times poor) products to unsuspecting investors. SPY launched with a cost of 0.2% ($20 for every $10,000 you invest), unheard of in the 1990s outside of some Vanguard indexed mutual funds. SPY was everything the status quo wasn’t – low cost, passively managed, tax efficient, and it didn’t pay brokers to peddle it. Oh – and it could be traded during the day if you were so inclined. Mix in the rise of the Internet in the late 1990s/early 2000s, which provided investors the ability to cost and performance compare their investments, and all of the right ingredients were in place for the perfect ETF storm (I also highly recommend this piece from Michael Kitces on the role of the Internet in ETFs’ ascent). That said, it took a while for the perfect storm to fully get its act together. In 2003, 10 years after SPY launched, there were still only around 115 ETFs, with less than $120 billion invested. 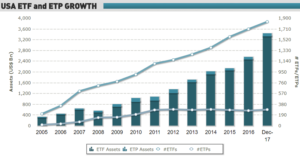 It wasn’t until after the global financial crisis (when investors realized their expensive mutual funds didn’t protect them from the market downturn the way they were hoping) that ETF growth really began accelerating. Fast forward to today, there are now 2,100+ ETFs with over $3.5 trillion! However, while cost rightfully garners headlines, the sheer entrepreneurial spirit and innovation of the ETF industry – which existed from the very beginning with the launch of SPY – may best epitomize ETFs. I will be attending the Inside ETFs conference next week, the world’s top ETF event. From past experience, I can tell you the people involved and the overall feel of the event is much more akin to something you might find in Silicon Valley. Innovation, on behalf of investors, is front and center. I find it somewhat paradoxical that ETFs have now existed for 25 years, yet they still feel so ground-breaking and new. I think that speaks to the inventive mindset of the industry. 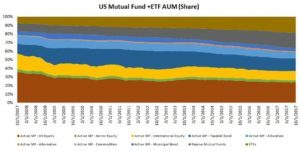 Smart beta ETFs, active ETFs, alternatives, commodities – even marijuana and blockchain ETFs! We can debate whether investors should use some of these products, but I don’t think the innovation (and havoc wreaking effect on Wall Street fees) can be questioned. “There is a manifest destiny for ETFs. That they are the structure people will use to get exposure to securities in the future, and mutual funds will be banished to the dustbin, like typewriters have been replaced by computers. It’s just a better technology and so it will come to replace funds over the next 20 years”. SPY started it all 25 years ago. The next 25 years should be every bit as exciting and rewarding for investors. As a side note, be sure to catch Tuesday’s ETF Store Show as Matt Bartolini, Head of SPDR Americas Research at State Street Global Advisors, will join me to help celebrate SPY’s 25th anniversary.